Discussion in 'Prisoners of War' started by brispencer, Mar 26, 2009. I have been tracing my fathers records as he was captured in the rearguard actions toward Dunkirk May 1940. I have had all sorts of help from the forum. I contacted the IRC about 6 weeks ago and received a letter this morning which has now confirmed his capture from german records so I now have actual date and place and also tells me he was originally sent to Stalag VIB then transferred to Stalag VIIIB. So, for anyone searching I would suggest you contact the IRC either through the website or at 19, avenue de la Paix, 1202 Geneva Switzerland. Be prepared for a wait but it could be worth it. One of my men was a POW at XXB captured at Dunkirk too. Do they past much info on to you or is it just confirmation? I have just wondered if the Germans took pictures of POW's for ID purposes. 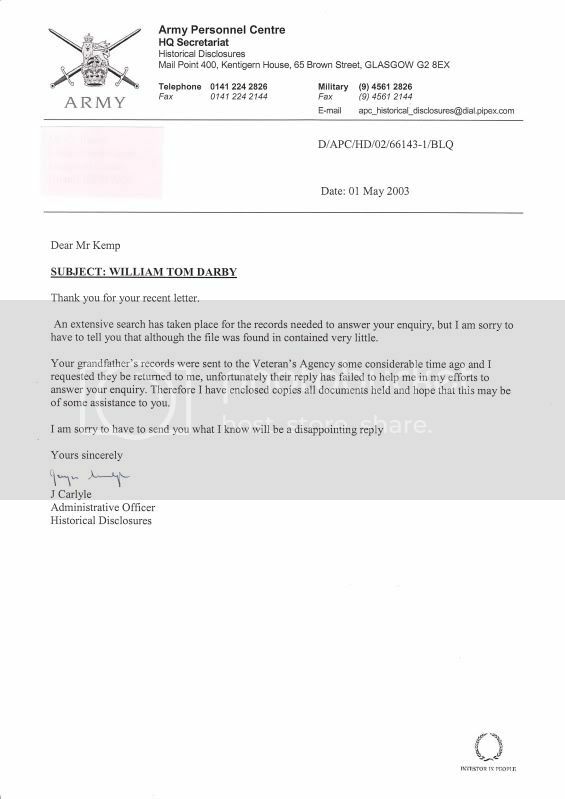 I received a letter giving name, dob, rank, service number (I knew these) date and place of capture, place aand date of detention and POW number. I didn't know exact date and place of capture (25/5/1940 Roubaix) but these tie in exactly with the route and fighting by his company. It also tells me he was in Stalag VIB and transferred to Stalag VIIIB on 18/6/1940. I knew about VIIIB but not VIB which I assume was a transit stop. Not much but nice details. No pictures but I do have the fairly standard one of him in a group outside one of the huts in VIIIB. I also have another of him immediately on his repatriation, needless to say, at that point, he was a mere shadow of the man I knew. PS anyone know where Stalag VIB was as there may have been several. I think I'll do that (I like the point of capture info) I don't have any photos but I'd love to know what four of the men I'm looking at looked like. I have a contact who was in Stalag 344 Lamsdorf who applied to the M.O.D. for his P.O.W. Records. When they came there was a photograph of him that had been taken when he arrived from Italy. When St.1VB was Liberated the prisoners broke into the Camp Office and as well as getting their own records they filled their pockets with anything they could find. Some years ago when the Association was active the Secretary,Lew Parsons,used to give a slide show of what photos they had"liberated"on the last morning of the Reunion. Very interesting. Stalag VIB was located at Neu Versen. I just need to pull my thumb out and get stuck in now me thinks. Would be interested to hear how your contact applied to the MOD for his POW records, any pointers ? Make sure you can give the V.A. as much details as possible. Good Luck! Thanks for the information 52nd Airborne, dont the V.A. just hold Service Records ? we already have these but I was interested in ADM199's comment about POW records and if these would give some additional information. I can also recommend CICR. I asked them about my great grandfather as I knew he was a PoW in WW1. It took 3-4 months for them to write back, but what they sent was invaluable for my research. You could get the mans story in his own words by checking at Kew for a Liberation report in WO344. Gnr W.T. Darby was in PG 54 Italy in August 1943 and St 18A as of May 1945. The first line of the address should be Veterans Advice team. You should give what details you have on the Person. Explain who you are and give a Contact No. The records were in Glasgow when my friend applied for his,but after speaking to the V.A.T. today I was told you have to access the records through Norcross. Tel. 0800 169 22 77. The V.A. (V.A.T. or whatever they call themselves this week!!!) hold all the German POW records that survived the war. Once I explained who I was and what I wanted the V.A. couldn't do enough to help me, I obtained a copy of my grandfathers POW records and I even struck lucky with a photo of him when he was processed at Stalag IVB. As Brian has already mentioned, the Liberated Prisoner of War Interrogation Questionnaire (WO344) may give you some answers. Many thanks for the replies and suggestions, especially Brian who offered to look up the Liberation Reports. Firstly I must apologise for the some what erratic replies, I'm absolutely snowed under with work at the moment, so time to spend on this is rather short on the ground. 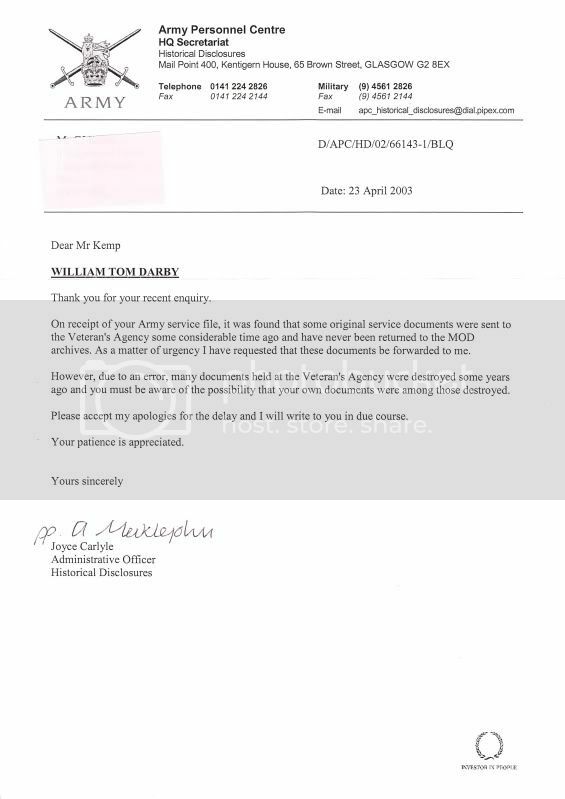 We orginally applied for the Service Records back in late 2002, and after a wait finally received a couple of letters in April/May together with some basic Service Details. So now I am asking myself is it worth trying another "Subject Access Request" together with some of the additional information we have gained to see if they can find any other information ? We picked up a copies of the Battery War Diaries and the Liberation Report from the PRO last year, together with those of the other POW's in the same work camp, which made fascinating reading, especially about the help they all received from the local cook when they all left the camp in early April 1942 and made their way to the Russian lines. A further account can be found at 934L, Glashutten. Finally as an aside I've been trying to find a list of those who served with 107 Bty, 27 LAA Regt (RA) with out any luck, Brian has given some usefull pointers, but I am sure the powers that be must have had lists at some point, but where are they now? Just a note to advise that if you are looking for information on POW's it is possiblle to contact the International Red Cross in Geneva as they hold German archives. I was looking for information on my father and the IRC provided me with a record of his exact date and place of capture (German records) which was the final piece of the puzzle and ties in exactly with his Company War Diary record. They will take a long time to respond to a query but it can be worth it. Goodness knows where the Italian camps are!!! !